Shallow Water Blackout (SWB) is the silent killer. Shallow Water Blackout occurs when a swimmer holds their breath while underwater. Swimmers are at risk of passing out due to a lack of oxygen. Since there is no struggle or signs someone is in danger, it can quickly result in death. Unfortunately, the number of deaths attributed to SWB is not fully known, because they are often labeled as a traditional drowning. So, what exactly is shallow water blackout? Why does SWB continue to occur and how can we, as Lifeguards and Aquatic professionals, make the public more aware of this issue. What is Shallow Water Blackout? According to http://www.shallowwaterblackoutprevention.org/how-it-happens, Shallow Water Blackout results from hypoxia (low oxygen) to the brain. What triggers one to breathe is the elevation of carbon dioxide (CO2), not low oxygen (O2). The danger is exacerbated with hyper-ventilation prior to breath-holding. One basically “blacks out” or faints in the water. For some, their lungs will take on water leading to drowning while others simply suffocate or die of other causes brought on by the breath-holding. SWB can happen in as little as three feet of water. It can happen so fast that even the most experienced lifeguard could miss it. Swimming World magazine stated some are caused by kids who dare their friends to a breath-holding contest. Not wanting to lose, one of them will push their bodies past the limit, when their brain shuts down before it tells the body to go to the surface. Why does it continue to happen? There is a lack of education and awareness on the dangers of breath-holding. When you go to a pool you almost always see a “No Running” or a “No Diving” sign posted but “No Breath-Holding” signs have yet to become the norm. Another issue is that underwater breath-holding and underwater swimming has been practiced for decades. Breath-holders, whether it be a competitive swimmer, a child, freediver, etc., do not understand how to prevent SWB. The CDC warns that “dangerous underwater breath-holding behaviors” can lead to otherwise strong, healthy swimmers losing consciousness underwater and drowning. What can we do to make those who visit our facilities more aware of SWB? As an Aquatic Professional, I think that taking the time to educate the public, as well as the lifeguards who serve those that use your facility, is key in helping to raise awareness. Pool signage and a small handout with information and tips on preventing Shallow Water Blackout (see tips below) for the bathers could go a long way. Holding an in-service training for your lifeguards on the importance of monitoring breath holding could help them identify risky behaviors. Make sure that they always scan the bottom of the pool. Remind them that even when its swim team practice, they should stay vigilant (remember: they have lifeguards at the Olympics too). Creating a conversation among the staff about staying safe is always a good thing! At Safety Training Pros we proudly serve the Northern California & Northern Nevada for all your aquatic training needs. We offer Waterfront Lifeguard, Lifeguard, Shallow Water Lifeguard, Basic Water Rescue, Safety Training for Swim Coaches, Lifeguard Instructor, and Pool In-Service Training. If you or your facility need training, please contact us at [email protected] or 1-844-900-SAFE. Emergencies happen when you least expect it, however the more prepared you and your facility are to deal with these types of incidents and accidents the safer everyone will be. Various documents have been produced by OSHA, FEMA, and other government agencies to help businesses prepare for emergencies. Does your company have an Emergency Action Plan (EAP) for a Fire, Medical Emergency, Bomb Threat, Chemical Spill, or a Shooter on Site? Would you or your co-workers know what to do? The purpose of an EAP is to facilitate and organize employer and employee actions during workplace emergencies. At Safety Training Pros we are committed to making sure businesses are more effective when it comes to Emergency Planning, In-Service Training, and much more. We want to make sure that your staff is safe in case of an emergency. It is important to remember to include both management and employees in creating an emergency action plan. Create a Safety Team that meets on a regular basis. Make sure to review the plan and assess it so that necessary developments and changes can be made. It’s also important, of course, that you write up this plan and provide copies to every employee in your workplace. Remember, you don’t come to work expecting an incident or accident to occur, but the more prepared you are the safer everyone around you will be. For more information on safety training such CPR, First Aid and AED please contact Safety Training Pros at 844-900-SAFE (7233). Is your workplace prepared for an emergency? Emergencies can happen anytime and anywhere. Workplace injuries and illnesses cost our economy 198 billion dollars a year. Many businesses are required to train their staff in workplace safety using Injury and Illness Prevention Programs. Others see the value in training their employees because they know that training could have a huge affect on reducing the number and severity of workplace injuries. Getting trained is easy and our professional instructors will ensure your employees have the knowledge and skills to respond to real-life situations. The Occupational Safety and Health Administration (OSHA), approximates that 10,000 cardiac arrests occur while victims are at work, and when CPR and First Aid care is provided within the first five to seven minutes of an incident, a victim’s chances of survival can increase by 60 percent. CPR and AED training is a hands on course that teaches students how to provide care for victims of sudden cardiac arrest along with the safe use of an automated external defibrillator. Additionally, First Aid training provides information about how to assess and respond to medical and trauma situations includes bleeding, shock, head and spinal injuries, stroke, anaphylaxis, and much, much more. Employees in any occupation can benefit from being prepared to respond to an emergency in the workplace. Safety Training Pros can help ensure that your company is up to date with safety regulations and best practices. We offer an assortment of convenient, competitively priced training options. For on-site training information request a quote, contact us at [email protected], or 844-900-SAFE. When it comes to your health, preparing for the worst isn’t pessimistic. It’s smart. That’s why experts advise everyone to stash medical supplies for a rainy day. Or, you know, a day when you’ve just sliced your finger, sprained your ankle, or broken out in hives. A well-stocked first-aid kit is easy to prepare and useful in both minor and more serious emergencies. The bathroom may seem like the ideal spot to stash the essentials, but because of heat and humidity, it’s not the best place to keep medicine or many diabetes supplies. Instead, store your first-aid kit in a room where you spend a lot of time or in an easy-to-reach area of a closet. Creating your own kit is easy. Start with a waterproof container, then add the supplies listed (“In the Kit,” below). As far as medications go, experts recommend adding baby aspirin to the mix, which can help during a heart attack. (After calling 911, chew two baby aspirin or one non-coated adult aspirin. Chewed aspirin works faster than swallowed pills.) There’s less of a consensus about other medications. Those that must be kept cold, such as insulin, don’t need to be included. Others, such as cough syrup, ibuprofen, and antidiarrheal drugs, can be added to the mix. The tricky part is keeping items current. “If you’re going to put medications in there, anything that can potentially expire, you want to check that often,” says David Berry, PhD, ATC, an athletic trainer, professor at Weber State University, and member of the American Red Cross Scientific Advisory Council. He recommends reviewing the items in your first-aid kit at least twice a year and replacing anything that is expired. Wound-care products are some of the most important items in your kit. Irrigation solution, for instance, is helpful for cleaning wounds of dirt, debris, and bacteria. That’s a particularly important step for people with diabetes, who are more susceptible to infection. Another aspect of building a first-aid kit you’ll want to pay attention to: your family’s allergies. Is someone allergic to latex? Stock non-latex gloves and bandages. Do you have an allergy to certain antibiotic ointments? Be careful to stash the right type in your kit. For diabetes, take extra precautions. You can’t store insulin in a first-aid kit because it needs to be refrigerated before opening. But you can stock other supplies, such as a backup meter, extra insulin pump infusion sets, batteries for any devices you use, fast-acting glucose and glucagon for lows, syringes and pen needles, lancets, and a backup container of test strips (just be sure to use them before they expire!). Finally, keep a list of emergency phone numbers in your kit, such as the poison control center 800-222-1222 and your doctors’ office. If you’ve injured yourself, make a follow-up appointment with your health care provider. First aid is essential, but it’s only the first step in the process. Continued care can ensure you stay safe in the long run. The following supplies make for a comprehensive first-aid kit. Clean the wound with soap and water or using a wound wash, such as saline solution. Coat with antibacterial ointment, such as Neosporin. Use sparingly. Call for a doctor’s appointment to follow up if needed (if you need stitches, for example, or the wound shows signs of infection, such as redness and pus). While it’s not entirely necessary to store medications in a first-aid kit (aside from aspirin, which is crucial during a heart attack), it may be a good idea to include the following. When you hit the road, grab your kit. That way, if you’re ill but can’t find a pharmacy, you’ll have the basics on hand. *Or your doctor may prescribe a just-if-needed antimicrobial medication, such as tetracycline. November is American Diabetes Month. If you have diabetes, no matter what type, it means you have too much glucose in your blood, although the causes may differ. Too much glucose can lead to serious health problems. Here are 10 prevention tips, followed by current American Red Cross first aid protocol for treatment of diabetic emergencies, to help you stay on track! 1. Reduce Stress – Learn to meditate to improve your blood sugar levels. 2. Step Out – Exercise helps keep your weight and blood sugar under control, and just about everyone can do a brisk daily walk. 3. Eat Right – Follow your food plan. If you don’t have one, ask your doctor about seeing a dietitian who specializes in diabetes. 4. Jet Set – Before you hit the road, get a checkup, pack extra medication in your carry on, and plan your doses around time zone changes. 5. Hang 10 – Drop 10% of your body weight through diet and exercise. 6. Healthy Choices – Swap saturated fats and refined sugar for healthy fats in nuts and sweet whole fruit. 7. See Clearly – Diabetes complications can cause vision loss or blindness. Schedule a full eye exam at least once a year. 8. Take Care of Your Feet – You may not feel foot injuries, so check both feet daily for blisters, cuts, or sores. 9. Show Color – Pack your plate with a palette of greens, yellows, and reds — like spinach, squash, and tomatoes. 10. Learn More – Visit WebMD’s Diabetes Center for news, tips, a blood sugar tracker, and more. Diabetes is a chronic condition characterized by the body’s inability to process glucose (sugar) in the bloodstream. An organ called the pancreas secretes insulin, a hormone that causes glucose to be moved from the bloodstream into the cells, where it is used for energy. In a person with diabetes, either the pancreas fails to make enough insulin or the body’s cells are unable to respond to insulin. Either situation causes glucose levels in the bloodstream to increase. A person with diabetes may manage the condition with insulin injections or oral medications. Diet and exercise also play an important role. To keep blood glucose levels within an acceptable range, food intake, exercise and medication must be balanced. A person with diabetes must follow a well-balanced diet, with limited sweets and fats. The timing of meals and snacks relative to exercise and medication is important as well. If food intake, exercise and medication are not in balance, the person may experience a diabetic emergency. ■ Hypoglycemia (excessively low blood glucose levels) can result if a person misses a meal or snack, eats too little food, exercises more than usual, vomits or takes too much medication. ■ Hyperglycemia (excessively high blood glucose levels) can result if a person eats too much food, takes too little medication, exercises less than usual or experiences physical or emotional stress. A person who is having a diabetic emergency will seem generally ill. He or she may feel dizzy or shake, have a headache, or have cool, clammy skin. The person’s behavior may change (for example, he or she may become irritable, aggressive or argumentative). If the person is experiencing hyperglycemia, his or her breath may have a fruity or sweet odor. Severe hypoglycemia or hyperglycemia can result in confusion, seizures or loss of consciousness and may be life threatening. Call 9-1-1 or the designated emergency number if the person is unresponsive, not fully awake or having a seizure. While you wait for help to arrive, provide appropriate care. For example, if the person is not fully awake, interview bystanders and conduct a head-to-toe check, then put the person in the recovery position. Make sure the person’s airway is clear of vomit and monitor the person’s breathing until help arrives. If the person is having a seizure, take steps to keep the person safe while you let the seizure run its course. A Spoonful of sugar mixed into a glass of Water. If it is safe for the person to have sugar by mouth, give 15 to 20 grams of sugar. Check the label on packaged products to determine how much of the package’s contents to give. Even if the person is experiencing hyperglycemia (too much glucose in the bloodstream), giving the person 15 to 20 grams of sugar will not cause additional harm. If possible, have the person check his or her blood glucose level. If the person is not feeling better in about 10 to 15 minutes, call 9-1-1 or the designated emergency number. Some people with diabetes may have a prescribed glucagon kit that they carry with them to use in case of a severe hypoglycemic emergency. Glucagon is a hormone that stimulates the liver to release glucose into the bloodstream. The glucagon kit is only used when the person is unresponsive or has lost the ability to swallow. Those who spend a significant amount of time with the person (for example, family members, teachers, coaches or co-workers) may receive additional training to learn how to administer a glucagon injection. Here at Safety Training Pros, we take health matters seriously. Making sure that you understand what Diabetes is, and what the signs and symptoms are, may help you care for a person who is having a diabetic emergency. If you, or a loved one, need first aid training please contact us at [email protected] or 916-538-6447. We are here for all your safety training needs. Have you ever asked yourself, what is the rationale behind the steps for caring for an unresponsive person with an obstructed airway? The American Red Cross has done a great job of explaining this below. Since the evidence evaluation process in 2005 with a re-affirmation in 2010 and 2015, the care for a person with an obstructed airway that is (or becomes) unresponsive is to perform CPR. Part of the rationale is based on principles of education and part is based on the science (medicine and physics). From an educational perspective it is easier to learn and remember fewer skills and by teaching trained responders that when a person is unresponsive and not breathing to perform CPR. It simplifies the process and increases the likelihood that a responder will remember (and hopefully) be more willing to act. Because the evidence supports the delivery of chest compressions (chest thrusts) to relieve an obstructed airway, the process of CPR with a slight modification if a breath will not go in is the new standard of care. I am often asked, “Will the attempt to give a breath push the object further downward?” The general answer is no, but if it does go far enough it may not immediately matter. Air will travel the path of least resistance and when a person becomes unresponsive often the muscles in the airway that may be closed or in spasm when the person is awake will relax allowing an attempted breath to pass by the object and provide at least some oxygen or the object may move or be dislodged when the person is lowered to the ground. The amount of pressure or force to deliver a breath should not be able to move a lodged obstruction, but if it were able to move the object further downward and the object was small enough to pass beyond the vocal cords (the narrowest portion of the airway) it may relieve the complete obstruction or move the object out of the trachea (windpipe) and into most likely the right bronchus allowing air to pass into the left lung (while not ideal, certainly affords time for the problem to be corrected by a healthcare professional). The other component relates to a person who was unresponsive with an unknown obstruction. If you were unable to ventilate a person initially and felt there was an obstruction and changed the procedure to skip ventilations all together, it could prove to be a critical error. There are several reasons that a trained responder may be unsuccessful providing ventilations, with an airway obstruction being only one and perhaps the least common. Proper opening of the airway and seal are common errors that are correctable and should be attempted when a breath does not go in. Immediately switching to no ventilations would sacrifice the ability to provide oxygen after each set of 30 compressions (30:2 is still considered the standard of care for trained responders over hands-only CPR based on the science (and especially with an airway or breathing cause)). Are you in need of CPR or First Aid Training? Is it time to get re-certified? Safety Training Pros is the premier safety training experts for individuals, groups, businesses, and government agencies. We provide professional training with high quality safety training materials in an engaging atmosphere so our clients have the life saving skills and knowledge that they need in an emergency. As a Licensed Training Partner of the American Red Cross, ASHI, and Medic First Aid, the leading providers of health and safety training, we can easily and efficiently provide the quality professional training required by all our customers. To speak with a safety expert please call us at 844-900-SAFE or visit us at www.safetytrainingpros.com. October is Sudden Cardiac Arrest Awareness Month! According to Heartsine.com, Sudden Cardiac Arrest (SCA) is a malfunction of the heart’s electrical system, which causes it suddenly and unexpectedly to begin to beat rapidly, then erratically, and finally to stop altogether. When this happens, the heart cannot pump blood effectively. As such, blood flow to the brain is compromised and the victim quickly loses consciousness. What can we do to increase the survival rate? Where can I get this type of Training? Safety Training Pros is the premier safety training experts for individuals, groups, businesses, and government agencies.We provide professional training with high quality safety training materials in an engaging atmosphere so our clients have the life saving skills and knowledge that they need in an emergency. As a Licensed Training Partner of the American Red Cross, ASHI, and Medic First Aid, the leading providers of health and safety training, we can easily and efficiently provide the quality professional training required by all our customers. This includes, but is not limited to, CPR and AED training. Please call us for more information at 844-900-SAFE or visit us at safetytrainingpros.com. In August, Gov. Jerry Brown was given a month to sign a new bill that would make CPR training a high school graduation requirement. Over the weekend, he signed that bill putting it into effect beginning the 2018-2019 school year. Below is an article, by EMS1 Staff at ems1.com, that discusses the importance of having this type of training in our schools. SACRAMENTO, Calif. — Governor Jerry Brown signed AB 1719 to teach CPR in schools into law Sept. 24. The new law makes California the 35th state to provide CPR training in high schools, along with Washington, D.C.
High schools that require a course in health education for graduation will begin to offer instruction in performing CPR in the 2018-2019 school year. Students can be taught the fundamental life-saving skill of hands-only CPR in 30 minutes or less. Berry was at a birthday party when a group playing in the pool realized one of their friends was at the bottom. As they brought him to the surface, Skylar, who was 11 at the time, remembered the CPR training she’d received and immediately sprang into action. Since then, she’s been a strong advocate for teaching CPR to her fellow classmates and created the “Stayin’ Alive” club at her school to convey the importance of learning the lifesaving skill. With the passage of AB1719, tragedies like the loss of Debbie Wilson’s daughter can be averted. Supporters of the bill included AHA, the American Red Cross, the California Professional Firefighters, the California State Parent Teacher Association, the California School Boards Association and California School Employees Association. The practices of hyperventilation preceding underwater swimming and extended breath-holding in the water are dangerous and potentially deadly activities. These activities can put the body in a state of hypoxia—a condition in which the body is deprived of adequate oxygen supply. It is our goal to educate those that we teach about the risks of hypoxia in the water and help ensure that they do not engage in behavior that could result in loss of consciousness and death. This includes lifeguards, Water Safety instructors and swim coaches, participants in a learn-to-swim program and their parents as well as the general public who engage in aquatic activities. The result of these activities is referred to by some as “shallow water blackout.” The use of this terminology in these cases is misleading since water depth is not a factor in the body’s response to hyperventilation and extended breath-holding. Shallow water blackout is the medical condition that can result as a deep water diver returns to surface and blacks out in water that is typically less than 5’ deep. There are specific precautions and prevention strategies for this condition. In an effort to be more clear and accurate, Safety Training Pros will not use the term shallow water blackout. In our training programs and public education, we use terminology that describes the dangerous behaviors that should be prevented—voluntary hyperventilation preceding underwater swimming and extended breath-holding. For simplicity, we refer to this condition as hypoxic blackout. Lifeguards, instructors and coaches are trained to be alert and prevent swimmers attempting to hyperventilate and engage in extended breath-holding activities. Lifeguards are taught to respond quickly to any individual who is motionless in the water for any reason, including loss of consciousness. Water Safety instructors are also taught to limit participants to a single inhalation whenever they ask participants to hold their breath and submerge, and to set safety limits whenever setting up activities that involve underwater swimming. Being confident and comfortable underwater is an essential aquatic skill. Knowing what breath holding techniques are unsafe is important in exercising good judgment for safe skill practice and supervision of underwater aquatic activities. Stay safe this summer and remember When Every Second Counts, Your Training Matters! 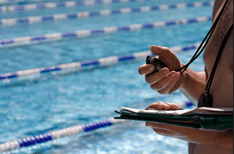 5 Lifeguard Interview Tips – Get the job you want! A lifeguard job interview is just the beginning of one of the most fun, rewarding and profitable summer jobs that a young adult can have. From fun in the sun to learning lifesaving skills, lifeguarding proves to be a gratifying way to earn money during the warm summer months. But before you can take a seat in a lifeguard chair, you must apply, interview and train. Interviewing for a job like lifeguarding may seem a bit intimidating, possibly even frightening, so here are some tips that will help ease your lifeguard job interview anxiety. Be confident. If you do not believe in yourself, no one will. Before the lifeguard job interview begins, take a few deep breaths and relax. Being calm will be important for a successful interview, but it will also show the recruitment officer that you can stay calm and focused in a stressful situation. Display good manners and be polite. Lifeguards interact with a variety of pool goers on a daily basis, so being personable and respectful to the interviewer is a must. Even if you are young, you will need to conduct yourself in a mature manner. The recruiter will see that you can interact with people professionally and respectfully, no matter the situation. Be flexible with your availability. The more hours you have available, the more flexibility you express for various shifts or days of the week, the more your potential employer will want to work with you. Dress up. Be sure to dress in appropriate attire for a lifeguard job interview. Even though you are applying for a job that only requires casual attire, it is smart to dress in a clean and professional manner to put your best foot forward – without the flip flops. Be organized and neat. Have your application, resume, and any certifications you have, in a neat and tidy package. If anything is handwritten, make sure the writing is neat and legible. On the job, you’ll be expected to complete reports and you want to showcase your ability to articulate and write a solid performance! Still nervous about the lifeguard job interview? Get your Lifeguard training at Safety Training Pros. Our instructors will ensure your rescue skills are tight and you have a solid understanding of your Lifeguard responsibilities. We will help prepare you for the interview and the job! After training, contact Safety Training Pros about our Lifeguard Intern Program. We’ll make sure your rescue and water skills are awesome, you’ll get valuable in water practice time, and you may even have an opportunity to work on your leadership and coaching skills. When you do a great job, you could end up with a strong recommendation for hire, job placement assistance, or a reference letter. This may be the edge you need to secure your spot with your new employer! Remember everyone has to go through the same interview and hiring process as you. Although the thought of interviewing for a job as a lifeguard can be stressful, it is well worth the effort. Remember to be confident, polite, flexible, presentable, and neat. You’ll see that securing a job as a lifeguard isn’t so scary after all.